We had an idea we would like to explore further with free and wild camping in the Mani in the Peloponnese however, during our stay in Koroni, we reviewed of the map, the guide book and after a non-expert assessment of the Greek situation following the Oxi (no) vote in the referendum, we decided that we probably should make our way out of Greece. After all, how many Greek salads have we got in us!? 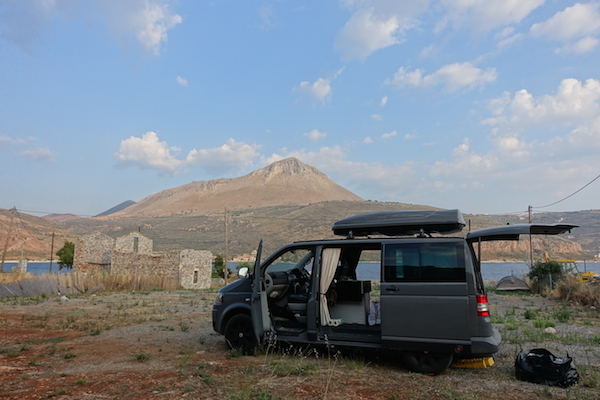 As naturally beautiful and peaceful Greece is, especially with so few tourists, we decided to head back to the ferry at Patra and take a quick look at Mystra and Sparti along the way. 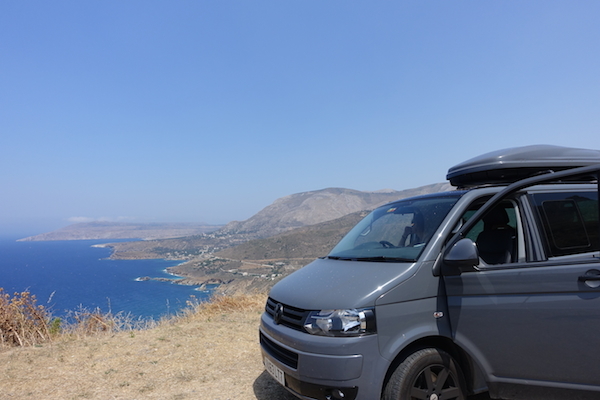 Our plan to leave put on hold, excited by our new destination, we set off to Stoupa intrigued by what we may find and the possibility of free camping in The wild Mani on the Peloponnese. On the way, passing through the outskirts of Kalamata, we noticed restaurants on the side of the road with whole roast pigs in boxes, could be a nice lunch and we justified the damage to our physiques by the boost we were giving to the Greek economy! Next one we saw, we stopped at. A kilo of spit roast pork, the best cracking ever, out of this world moist pitta breads and a wonderful fresh salad, €12. We drove the coast road out of Kalamata with fond memories and a promise to return. 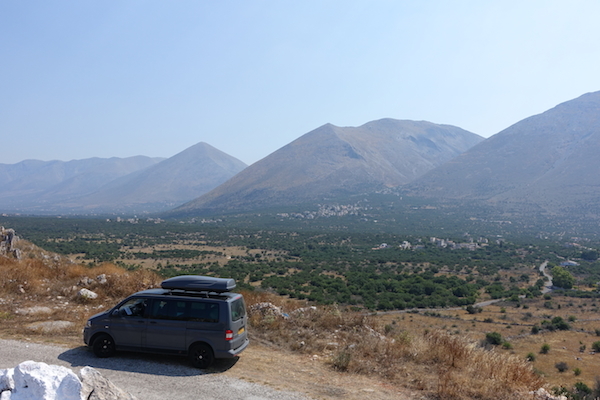 Assuming we were to camp (either at the site in Stoupa or wild camp somehow) we provisioned at a local mini market near Stoupa, 30mins from Kalamata. Plump Kalamata olives were plentiful, as were cheap local wines in plastic bottles that we just had to try. As we neared Stoupa our hopes dropped however; the ‘tower houses’ derived from the combative, feudal history of the region were plentiful but not one older than ten years, we are sure. Thomson holiday villas stood shuttered and closed but the tiny beach was still packed with people and their brightly coloured inflatables. The campsite was away from the beach, also busy, was shaded from the sun by pine trees and the skeleton of an unfinished hotel, not quite what we were looking for. We had admiration for the evidently free spirited, adventure loving Dutch couple but to spend 3 weeks here, they must really love their grandchildren! Disappointed and downhearted we hit the road again south into the Mani hoping to find somewhere, anywhere but Stoupa, to park and sleep for the night. As we drove the west coast, windy road the landscape got harsher as did the architecture, the villages smaller, more spread apart. No longer the cute, modern tower houses/ holiday homes but now the original towers that were built by families to defend themselves against the neighbours, against which they feuded. Some still lived in, some having not survived the fighting. Only in the 1960s we read intrepid explorers such as Patrick Leigh Fermour were told to (and did) avoid towns such as Vathi further south, due to the ongoing violent inter-family feuds. It was not hard to imagine and our guide book suggested that some blood feuds still remain today. 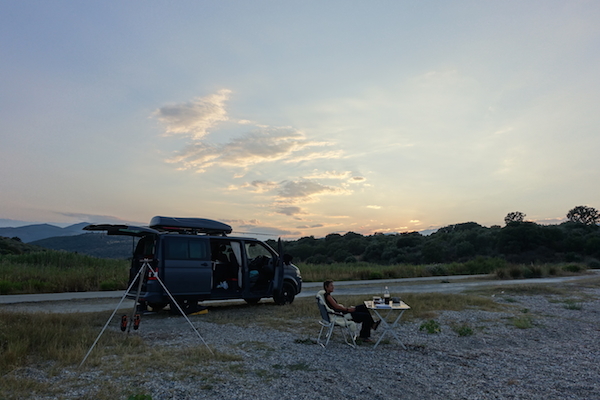 We were loosing faith in the Dutch recommendation and the sun was fading, when finally at Itlyo, just before Aeropoli, we spotted a sign ‘Free Camper Parking’! Amazing, or were we naïve to follow a home made sign along the narrow track off the main road. Let’s have a look at least. The track wiggled along the side a large natural harbour, past a couple of tavernas and then to a small, rough patch of land looking out to sea. There was a French camper parked in one corner, announcing we had found the spot. This can be it for the night we agreed, we have the last bit of sun, a view, peace and it’s not so bad to feel obligated to eat in the nearby taverna that obviously provided the free space. Local white wine and a selection of freshly caught fish looking out across the harbour as the sun finally dipped behind the inhospitable hills, confirmed it a good choice and not such a bad place at all for free camping in the Mani. Off early the next day, after a jog to explore the local neighborhood, where a path off into the hills promised a closer look at the castle we could see on the cliff tops. 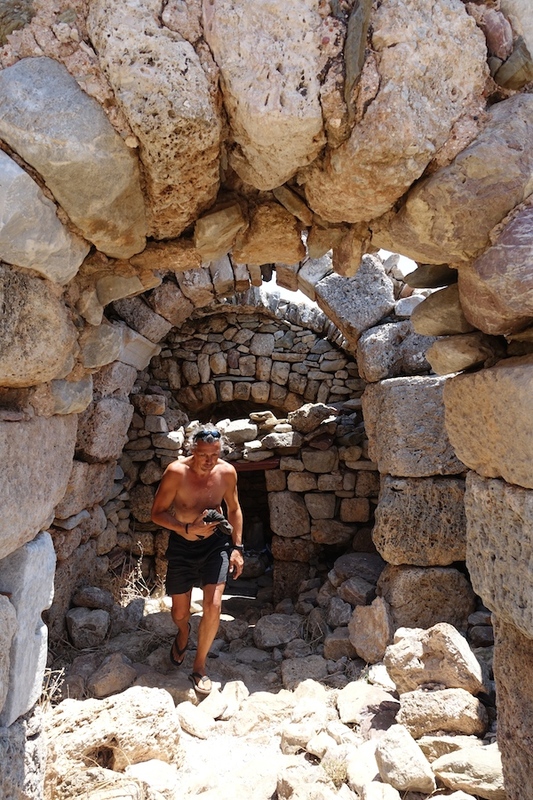 However we wanted to journey to the very end of the Peloponnese, to the ‘gateway to the underworld’. When we got there, we could almost believe the legend. Though we were in the hottest part of the day we had to endure the howling wind, sweeping across the barren rolling hills, whipping up the waves, and through Poseidon’s tumbled down chapel standing on the bay front. Ok ‘tick’ been there now let’s get out of this wind and onwards to Porta Kalia where the Dutch couple had suggested we may be able to free camp at a restaurant. We wound our way over the hills, through old battered and abandoned olive groves and down steep, remote valleys. Our heads told us it wasn’t the place as we turned the corner and looked down on the tiny harbour, probably once a wonderful old fishing village accessible only by sea, now a holiday home village and yacht destination. Our hearts through, told us to give a it go. As we zig-zagged our way to the very bottom, we spotted the ‘Free camper parking’ sign. I would never have believed you could fit so many restaurants and people into such a tiny harbour, so far from nowhere. As we approached the road across the beachfront to the camper parking, every restaurant started waving ‘park here’ signs at us! ‘Oh my goodness, let’s get out of here’. It was free camping but not exactly wild and remote experience of the Mani. We drove out of the shadow of the tourist trap and stopped to reassess. We dipped our toes in the water as we picnicked on Kalamata olives, Greek cheese and nectarines in an isolated corner of the pebbly beach and wondered where to try next. A long drive, Githio, further up on the east coast sounded like an interesting, large harbour town with a few beaches and several campsites. It was our last resort if we didn’t find anywhere else on the way. The drive through the Mani was fascinating, hot and hard. We drove through Vathio, now possible to approach though still a fortified village with lush bougainvillea toppling over tall gates and surrounded by arid abandoned olive groves. Across the southern Mani, there was a feeling of inhospitality, driven by a historic danger that needed the hardy souls to protect themselves from the weather, likely invasion and their neighbours. The architecture and landscape creates a dramatic atmosphere where many continue to live today and where others choose to convert old abandoned tower houses into remote holiday retreats. The Dutch folks recommendation didn’t result in a great a place to stay but did show us something remarkable and thought provoking that we would have missed. Finally over to the east coast and to softer hills where everything became greener. Wiggling along a narrow road above the sea we spotted a camper at the far end of a sweeping beach in the distance. Though wild or free camping is officially illegal in Greece, this had to be worth an investigation. We found the lane down to the long pebbly beach, backed by a flat plain full of olive groves and forest, with a German, a French and a Greek camper already settled at one end. We joined them, swam in the cool, crystal clear but surprisingly lifeless sea and dried off in time to see the sunset over the stubble covered hills of the Mani we had left that morning. We woke on the beach, always special, and after a coffee and another dip, we headed off to explore Githeo, a great town to live in as well as to visit, with its offering of coffee shops, restaurants and beaches, nestled in a crescent of hills. We lunched in a ‘country restaurant’ on the road back through the hills to our wild camping bay. Back at the beach all was more or less the same; the same few locals came for their late afternoon swim and the Greek camper remained under one of the few trees ‘owned’ by a solitary lady who spent the days alternately snorkeling and then re-oiling her mahogany skin. A new German camper had chosen ‘our place’ but there was plenty of room for everyone, who wanted to be free camping, even on this Saturday afternoon. We set up camp (parked and took the chairs and snorkels out) and cooled down in the clear waters again. We were keen to know more about the validity of wild camping and so later approached the silver haired and beautifully tanned German couple who looked very comfortable and at home on the beach. 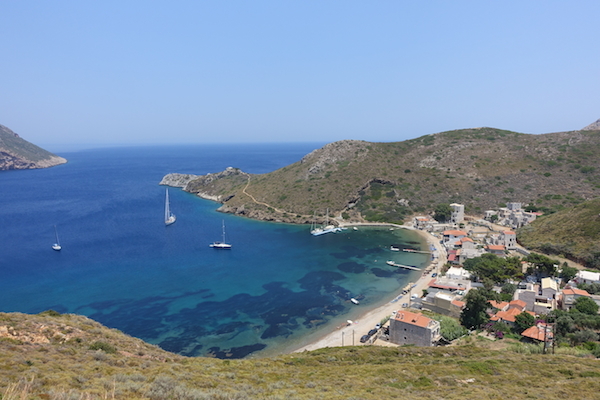 They now lived in the eastern finger of the southern Peloponnese, Lanconia, near Monemvasia (a Byzantine fortified town) and had come here for the weekend to celebrate his birthday with dinner in their favourite restaurant around the bay. They assured us it was not a problem to free camp in quiet places like this, they had once or twice been asked to move on by the police but, in true Greek style, ‘when you’re ready in the morning, please don’t be here tomorrow’. They asked where our travels took us next, we told them of our preference to camp on quiet beaches. Apparently, where they lived was beautiful with west facing, long open beaches where we would be virtually alone. With our map not highlighting anything better, we had just secured our next destination. In the morning we waved good bye to the Greek lady, as she stood thigh high in the water adjusting her snorkel and the German couple, just emerging from their van for a swim after a late night birthday celebration, before heading off towards Monemvasia and hopefully our next wild camp. Setting off in the van, energized by the morning sunshine, not knowing where you will be sleeping tonight, always gives us a buzz. For us, it’s the difference between an adventure and a holiday.